Fracture toughness and fatigue crack growth evaluation have been an integral part of Metcut Research material testing services since the development of standardized testing specifications. Today we utilize the finest systems available to perform these testing features supported by state-of-the-art data acquisition and machine automation. Metcut continues to expand its DC Electric Potential Drop (EPD) testing capability. Our FTA® systems provide automated test control and data acquisition for crack growth and fracture toughness testing. Careful placement of monitoring probes permits test gage lengths as small as 0.035 in. Fatigue crack propagation using the compliance method and the potential drop method of crack measurement. Specimens supported include Compact Tension (CT), Middle Tension (MT), Single Edge Notch (SEN), Single Edge Bend (SEB), Extended Compact Tension (ECT), various corner crack designs, and surface flaw designs. 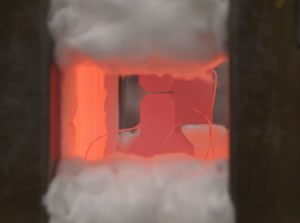 Metcut Research routinely performs testing from cryogenic temperatures to 1600°F (871°C). We also support steady-state cyclic fatigue, as well as dwell-time fatigue. Fatigue crack growth rates from the threshold regime to the critical region are typically developed, using constant load as well as K-controlled parameters. Static creep crack growth rate measurements using the potential drop method. The compact tension specimen is the standard specimen design for this specification. We typically perform this experiment at elevated temperatures. Plane strain fracture toughness testing. We use the Compact Tension (CT) design, Single Edge Bend (SEB), Arc-Shaped Specimens, and the Disk-Shaped specimens. We typically perform pre-cracking using the compliance technique. Testing temperature ranges from cryogenic regions to 1600°F (871°C). Elastic-plastic fracture toughness testing using the J-Integral technique. We typically perform this experiment using the Compact Tension (CT) design or the Single Edge Bend (SEB) specimen. Both the compliance technique and potential drop method of crack measurement is supported. Metcut Research employs the single specimen unloading technique to evaluate crack length measurements. Fracture resistance testing using the R-Curve (resistance curve) technique. Typically the specimen design of choice is the Compact Tension (CT) or the Middle Tension (MT). We perform testing using the compliance technique as well as the potential drop method of crack measurement. ASTM E-1290 – Fracture toughness testing using the Crack Tip Opening Displacement (CTOD) measurement method. This experiment is typically performed using the compliance technique on all the standard-geometry, fracture toughness specimens. Plain-strain fracture toughness testing using the short rod or short bar specimen design. We use this specification primarily for brittle materials.